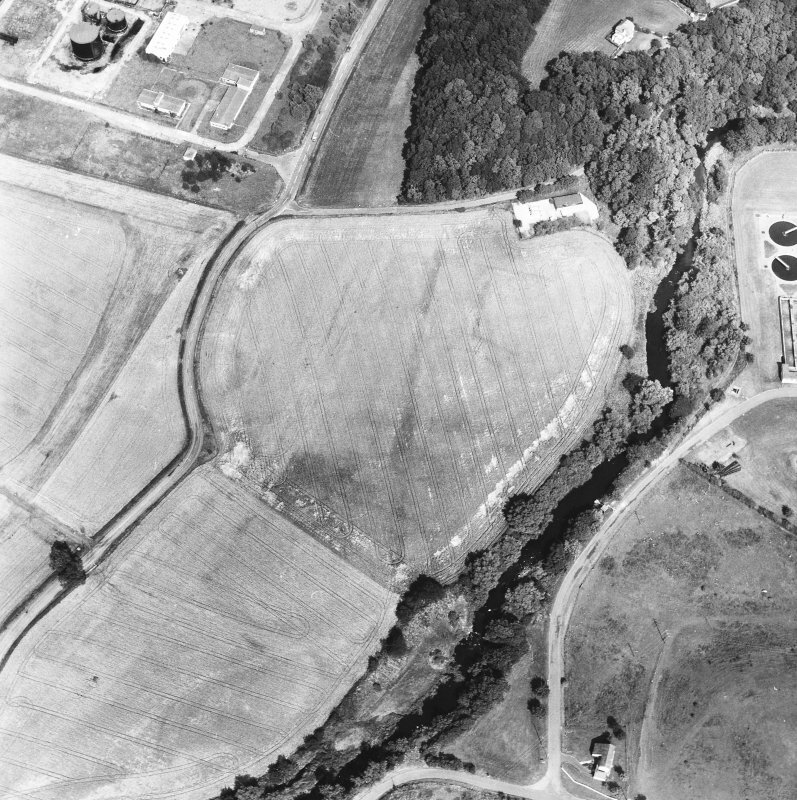 Oblique aerial view of the cropmarks of the Antonine Wall at Inveravon, taken from the SW.
NS 950 796 Trenching was carried out in a field on the east bank of the River Avon, Inveravon, near Grangemouth due to future road construction. Here, Sir George Macdonald (1934) suggested, there may once have stood a small fort, guarding the crossing of the Rover Avon. 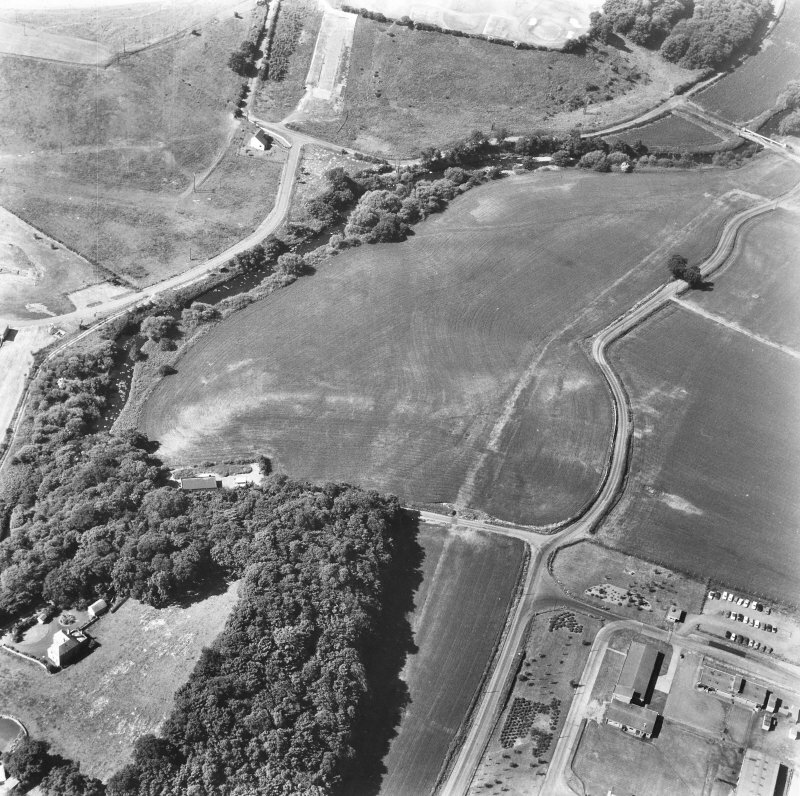 In 1967, the stone base of the Antonine Wall was traced from the hedge bordering the eastern edge of the field for 480ft westwards. About 480ft from the eastern border of the field and about 300ft from the river bank, there was the discovery of a stone foundation, 2ft wide. It was running N and S and made a T-junction with another stone foundation, also 2ft wide, running E and W. The N-S foundation was traced for 32ft N from the T-junction, and was found to have a break in it for a doorway at 13 to 17 and half feet N of the T-junction. At 32ft N of the T-junction the foundation turned westwards. N of this turn, or corner, there came a cobbled street almost 15ft wide, and N of that the Antonine Wall base. The Wall base was 14ft wide, with very massive kerb-stones. There were several layers of turf still standing above the base. The stone foundation running eastwards and westwards from the T-junction only survived by a few feet. There was also a short stretch of N-S foundation 25ft to the W of the T-junction which might indicate the line of the W wall of the structure. If indeed this was the W wall, the structure measured externally 38ft from N to S, and had a room or section which measured almost 30ft overall with an exit into another section to the E. No other foundations were encountered, but cobbling at two levels was exposed. Finds from the cobbling, from small stones and soil over foundations, and from tumbled stones over the street S of the Antonine Wall base included quern fragments, scraps of bronze, iron, glass and fragments of Roman course pottery. 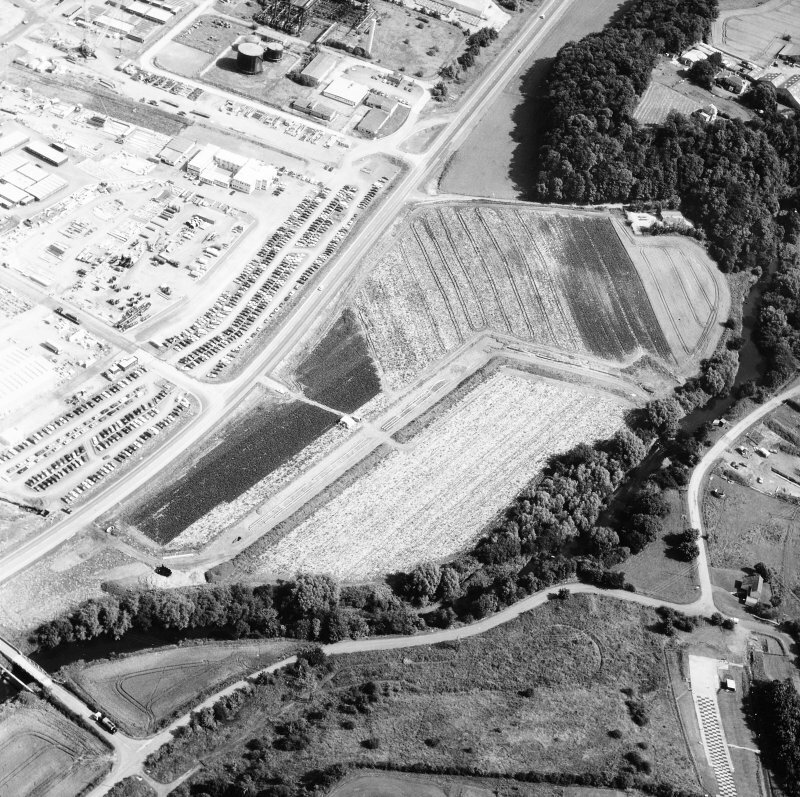 A small fort was built (see NS97NE 21.00), using the Antonine Wall (NS97NE 21.00/RRX 505) as its N rampart and the Military Way as its via principalis. It measures slightly less than 35m from N to S between ramparts, though no indication of its E-W dimension was attained due to the narrowness of the excavation trench. This dimension is substantially greater than those of the excavated fortlets known on the Antonine Wall, but markedly less than that of the smallest previously known fort on the frontier, at Duntocher. The presence of the River Avon presents a severe constraint on the N-S extent of the fort, and it is possible that the E-W dimension has been increased to compensate for this. 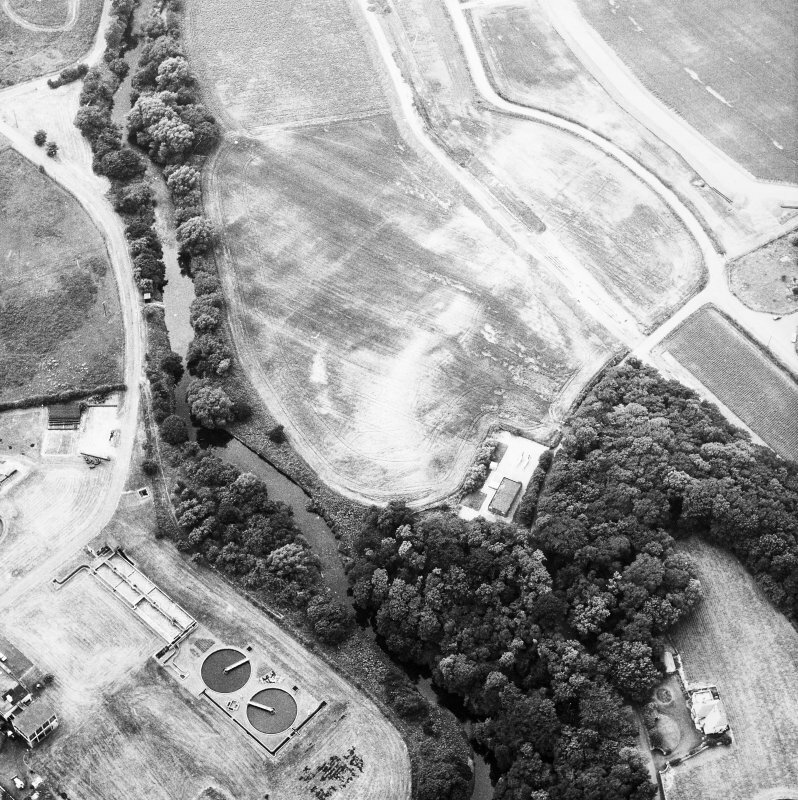 No external southern ditches were found, this requirement probably being met by the River Avon. 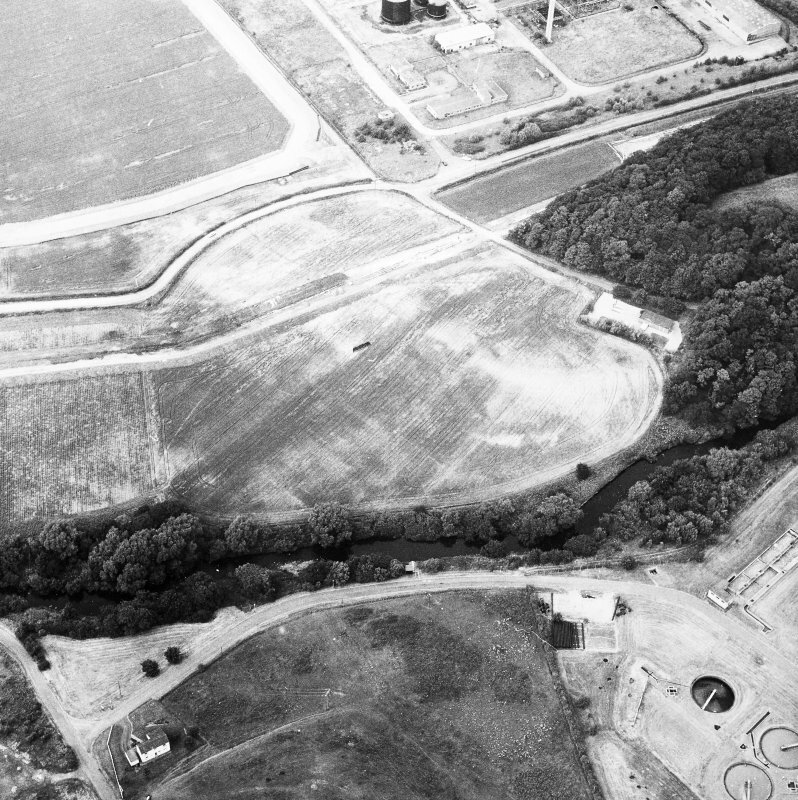 Defensive pits appear to have been added to the berm with the construction of the installation. The evidence of a type 18/31-31 Samian dish with the stamp of Asiaticus, which was sealed beneath the fort deposits to the S of the via principalis, strongly suggests that the construction of the installation can be dated to 155 AD - 160 AD (information from Brenda Dickinson). The mortaria assemblage from deposits associated with the buildings also indicates that occupation was not before AD 160 (information from Kay Hartley). The ceramic and stratigraphic evidence combine to demonstrate that the installation at Inveravon was not a primary element of the frontier system. These two phases of occupation were preceded by the poorly preserved remains of a possible iron smelting furnace adjacent to the southern rampart, although no stratigraphic relationship survived between the two. An Antonine date for the furnace was confirmed by its pottery assemblage. CFA 1992; S S Frere 1992. 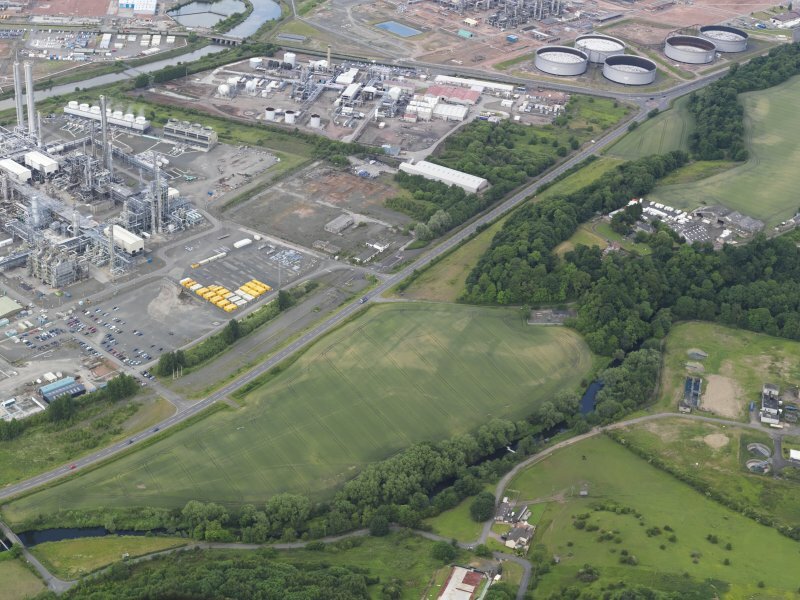 Site recorded during a desk-based assessment and field survey of a proposed pipeline route running from the proposed Mossmorran Offtake Station to the proposed End Terminal at BP Grangemouth. NS 9510 7970	Roman fortlet (NS97NE 21.01). Two detailed reports will be lodged with the NMRS. Information from Historic Scotland, scheduling document dated 25 June 2010. NS 952 797 Aerial photography and excavation have been undertaken in advance of the emplacement of a pipeline through the Scheduled area. 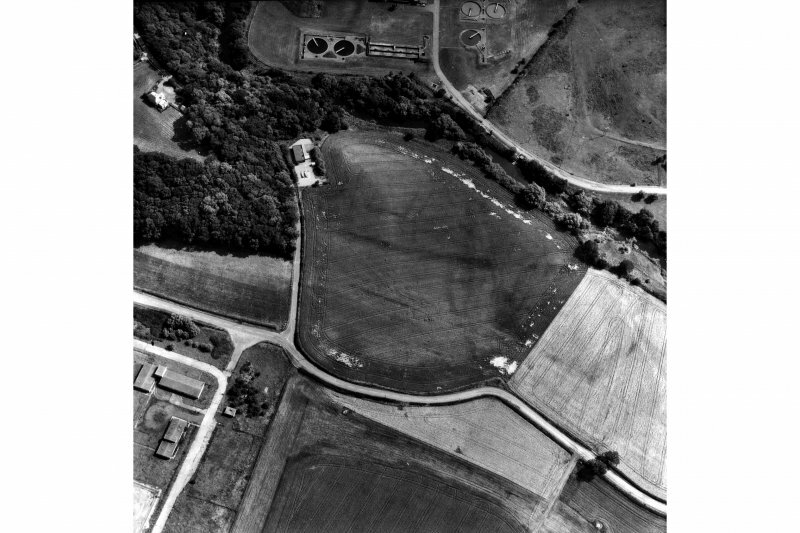 Ten oblique shots of the field immediately north of the River Avon, where traces of the Antonine Wall and attendant structures had previously been discovered by excavation (Robertson 1969), were taken on 19 July 1989 in fine conditions by Dr. Ian Ralston. These indicate clearly the course of the ditch associated with the Antonine Wall, and the course of an infilled mill lade once associated with the demolished Jinkabout Mill nearby. Linear soil marks of unknown origin area also visible to the south of the ditch towards the eastern edge of the field. 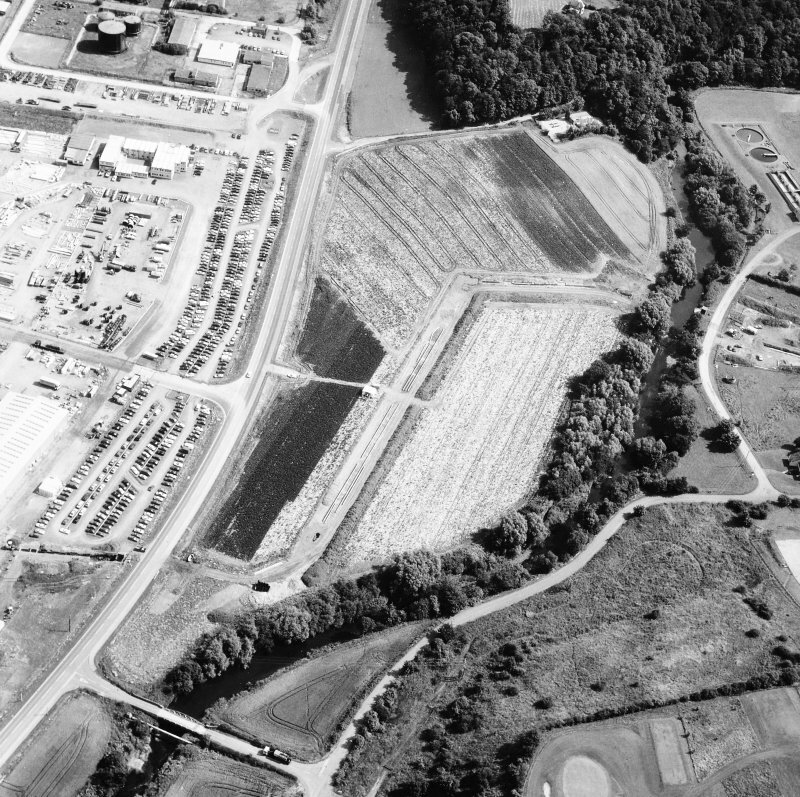 NS 952 797 Aerial photography and excavation have been undertaken in advance of the emplacement of a pipeline through the Scheduled area. 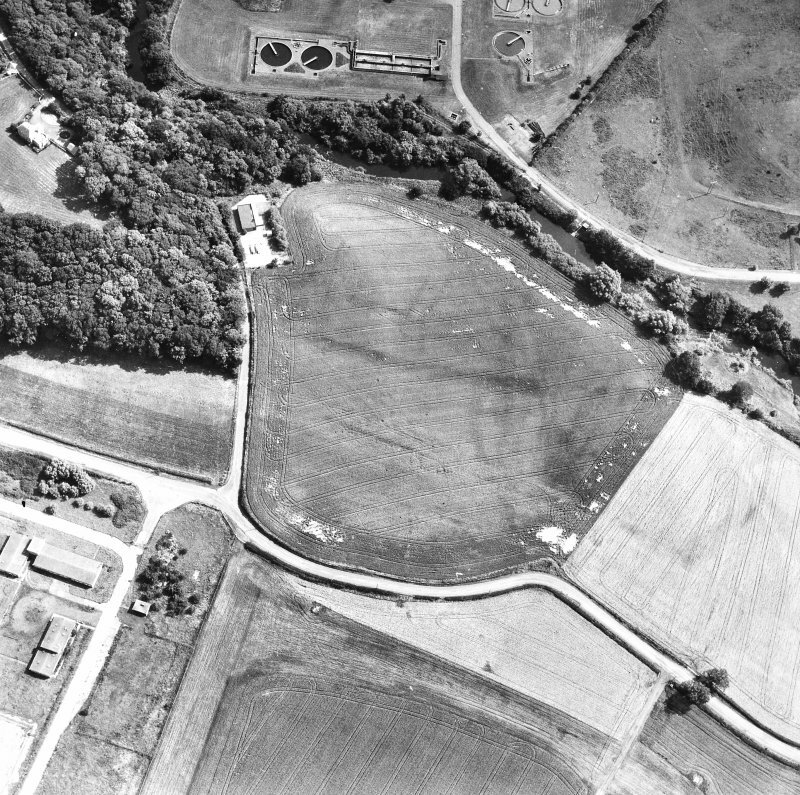 Following a programme of geophysical survey, a single trench 2m wide and 84.5m long, located on the line of the pipe trench, was excavated through the Scheduled area from March to June 1991. A complex structural sequence was recorded. The standard components of rampart, road, berm, ditch and upcast mound were present. These features appear to have been attended at an early stage by a buttress-type feature attached to the southern face of the rampart. This resembles most in form an 'expansion'. A small fort or fortlet (see NS97NE 21.01), with an internal north-south dimension of approximately 35m between ramparts, subsequently replaced this feature. Two distinct occupation horizons are contained within the ramparts. Sponsor: Shell Chemicals UK. Although there is a long tradition of a fort at Inveravon, there is no firm evidence of it. Trenching has produced a stone structure and occupation debris. 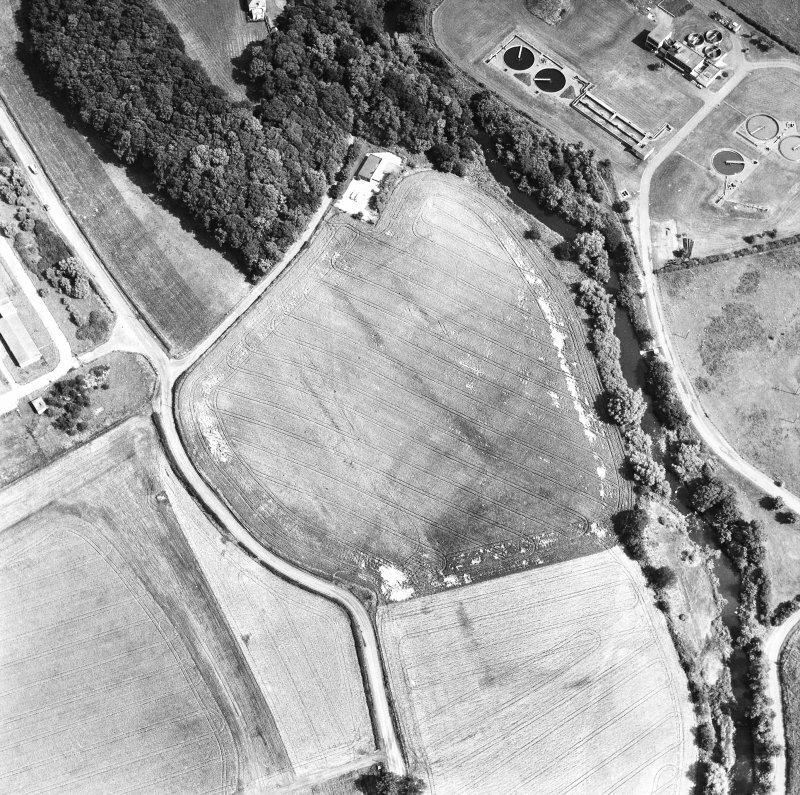 Aerial photographs show a series of linear cropmarks to the east of the structure (see NS97NE 65), but these cannot be identified as the fort. 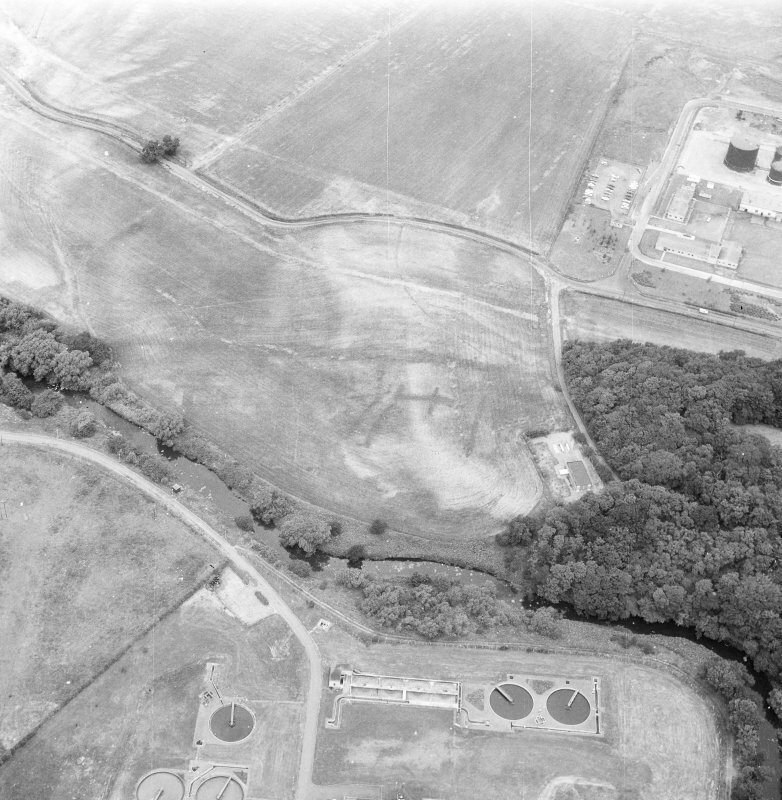 Excavations were carried out at Inveravon from March to June 1991, in advance of the construction of the North West Ethylene Pipeline. These have confirmed the presence of a small fort on the Antonine Wall (NS97NE 21.01) in the field immediately E of the River Avon. 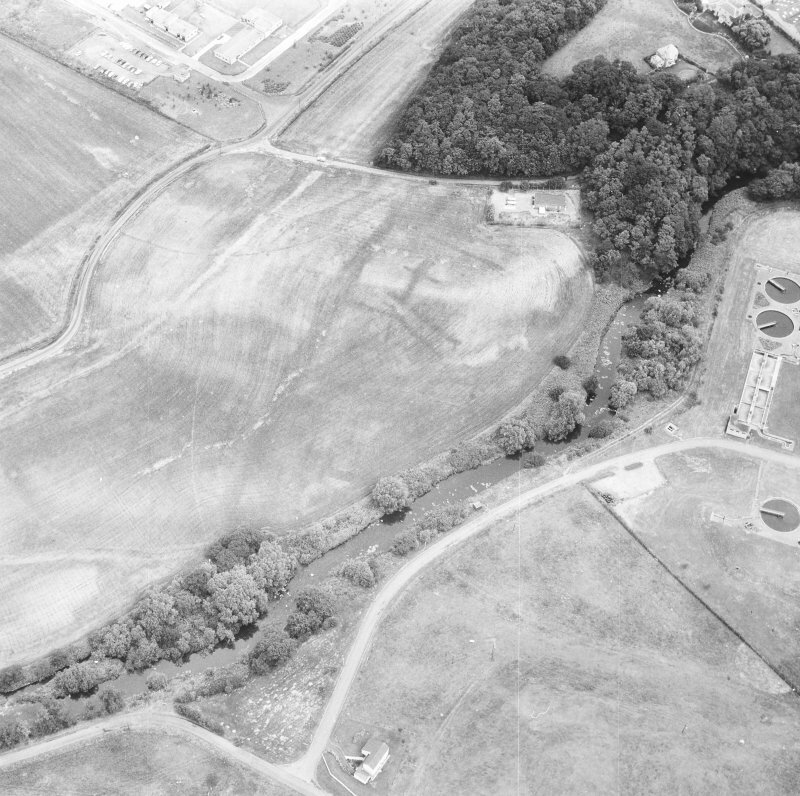 Previous excavations by Professor Anne Robertson had located a stone structure in association with cobbled surfaces to the S of the Antonine Wall. 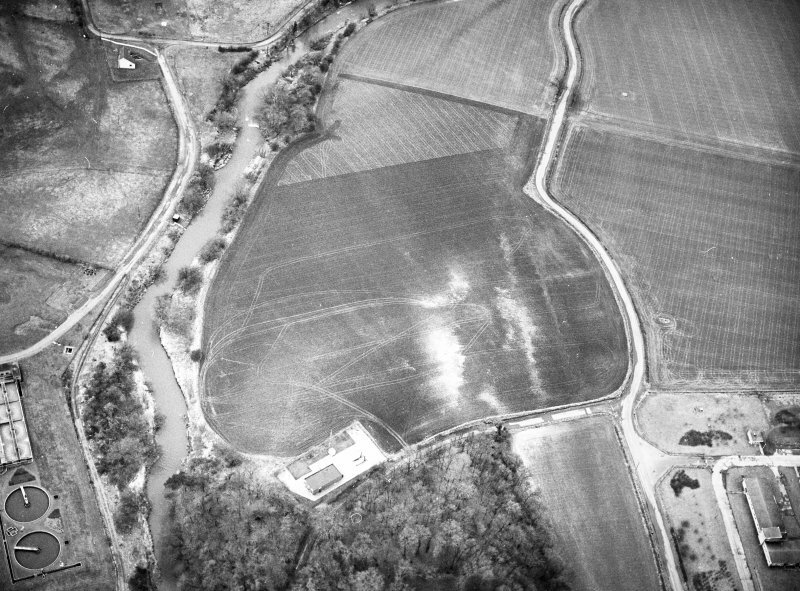 Aerial and geophysical survey carried out prior to excavation both clearly defined the course of the Ditch, but no other definite archaeological features were identified. A single trench 84.5m long by 2m wide was excavated perpendicular to the alignment of the frontier system, in accordance with the terms of Scheduled Monument Consent. A complex and relatively well preserved stratigraphic sequence was found. The frontier system - a buttress-like structure, most probably an 'expansion' was appended to the S face of the Antonine Wall as part of its initial construction. Its alignment appears deliberately to have been 8 to 10 degrees from perpendicular to that of the Antonine Wall, suggesting a trapezoidal ground plan. The ditch ran 9.2m to the N of the rampart, and was c8m wide. 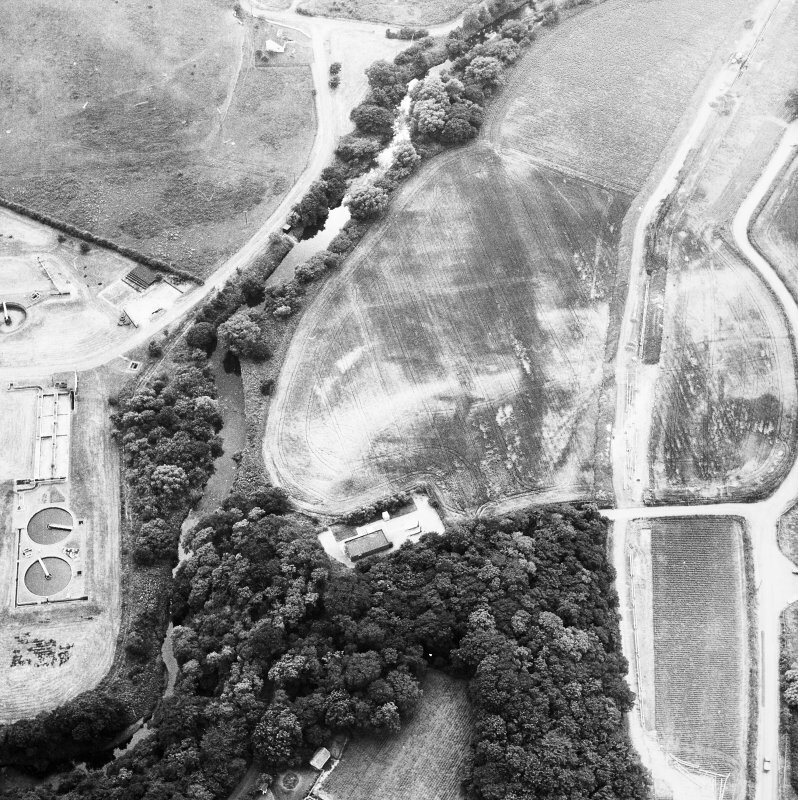 The terms of Scheduled Monument Consent did not permit full excavation of the ditch. The upcast mound spread out to the N of the ditch for 13m. The Military Way ran 16m to the S of the rampart. It was 5.2m wide, clearly cambered and constructed of a rammed pebble surface set on a cobble base. At some stage the expansion and/or rampart suffered a sudden collapse, creating a large mound of earth at the junction between the two. Sealed beneath this collapse was an irregular arrangement of stake-holes and a patch of occupation debris. This activity clearly relates to the use of the expansion, but does not elucidate its nature. NS 9510 7970 Excavation in advance of pipeline construction has provided further information on the nature of the Roman Military site (NS97NE 21.01) which abutted to the S of the Antonine Wall. 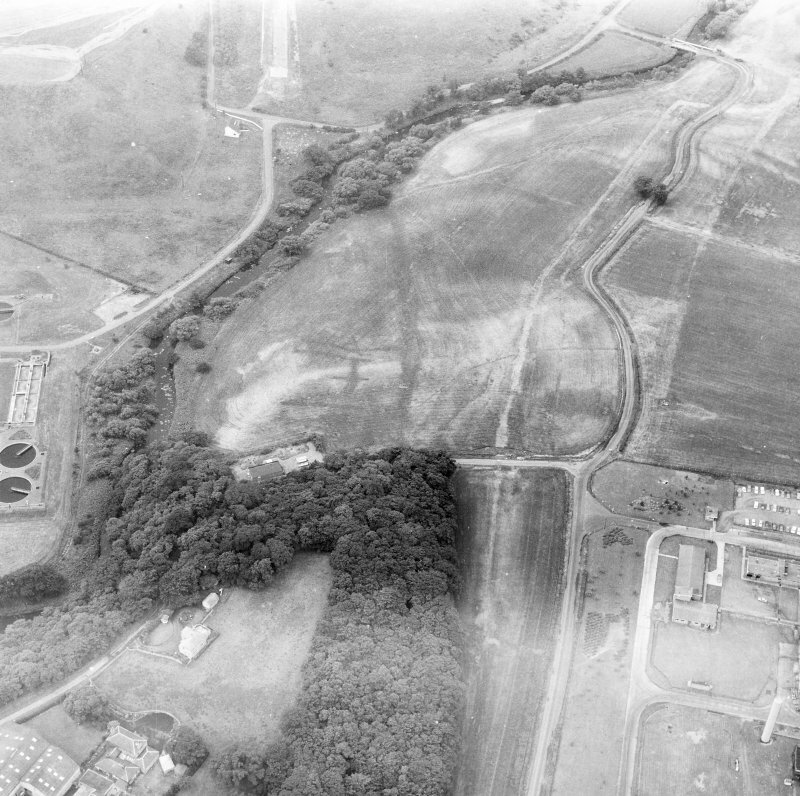 The excavated section of Antonine Wall (or Rampart) was c. 4.4m wide and up to c. 0.7m high. Its stone base, predominately of millstone grit but including a few river cobbles, was preserved intact, and comprised roughly of dressed kerbs containing a core of undressed blocks and chunks bonded by a stiff yellow clay. The millstone grit must have been quarried elsewhere and imported to the site, whereas the cobbles could have been obtained locally from the River Avon. Positioned directly above the stone kerbs were c.0.3m-0.4m wide cheeks comprising blocks of turf and clay. The S cheek was preserved up to 0.30m high and was of complex construction. The N cheek survived no more than 0.10m high and no trace of internal structure could be identified. 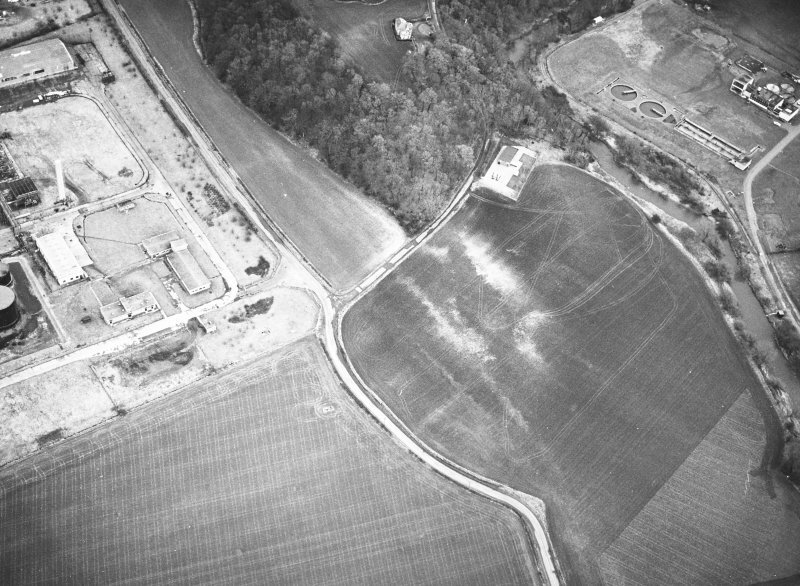 The basic pattern of a predominately earthen core revetted by cheeks of clay and/or turf is recorded in nearly all sections of the Antonine Wall excavated to the E of Watling Lodge (NS87NE 52.00), and was repeated at Inveravon (Keppie 1974). The western side of an abutting structure was revealed immediately to the S of the Rampart. This structure extended S for c.7.8m and survived up to c. 0.7m high. The stone kerb of the Antonine Wall continued unbroken past its junction with that of the abutting feature, with the implication that the latter was a secondary construction. The characteristics of this abutting construction most resemble those of an 'expansion'. Only six such structures have been identified on the Antonine frontier, occurring in pairs at Tentfield (NS87NE 5.00), Bonnyside East (NS87NW 4.00), and Croy Hill (NS77NW 16.00). However, the recorded width of c. 7.8m for Inveravon is substantially larger than the 5.5m maximum demonstrated by excavation at Bonnyside East (NS87NW 4.02) and Croy Hill East (NS77NW 16.02). 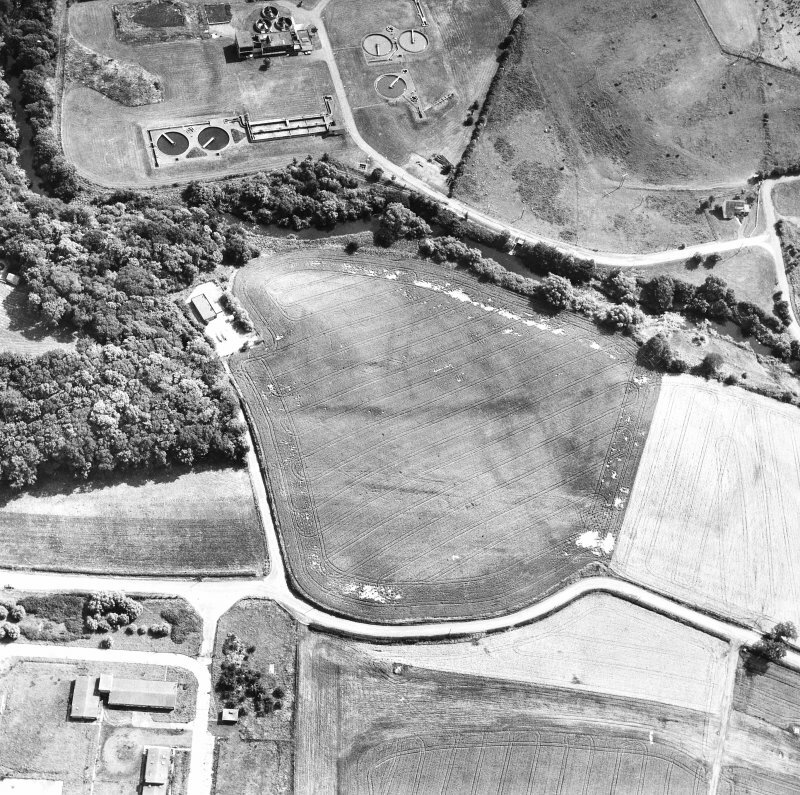 Furthermore, the only detailed ground plan recorded, at Bonnyside East, was square. The exposed fraction of the Inveravon structure indicates clearly that it does not have a square ground plan. The Berm was 9.2m wide and sloped gently down towards the S lip of the Ditch. Its uneven surface, defined by the gritty subsoil, as covered with a mixed clay deposits for a distance of up to 3.80m northward from the Rampart. The clay may represent trampled waste material from the construction of the Rampart. Two features were identified on the Berm. The first a steep-sided elongated pit or gully c.1.6m N of the Rampart, an exposed length of 1.35m, 0.4m wide and more than 0.3m deep. The second, probably of similar type laid c.3.3m N of the Rampart, was 0.55m wide and 0.25m deep, with steep sides. 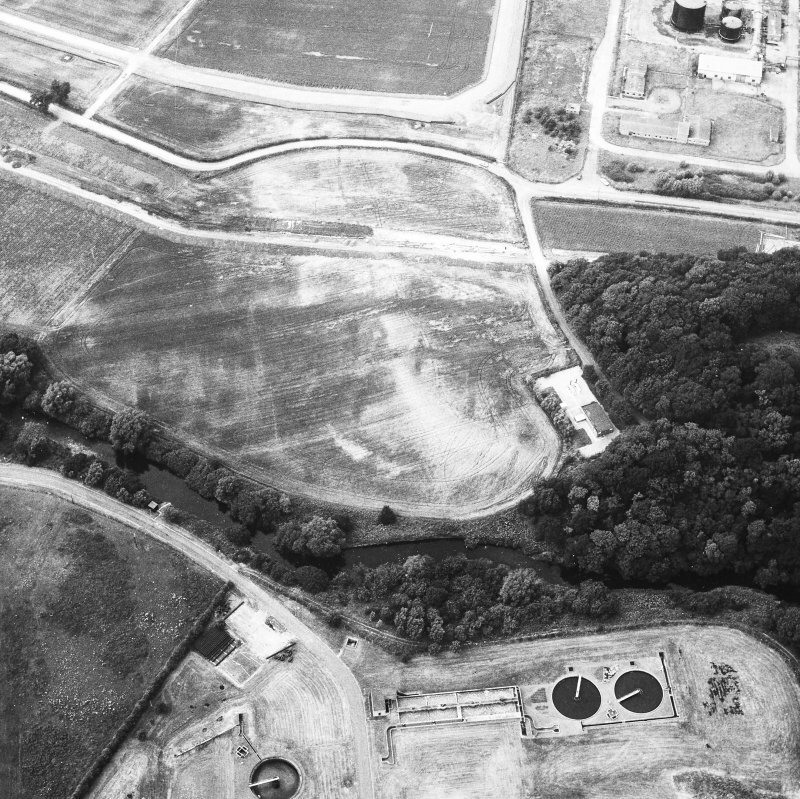 Features with similar characteristics, termed 'defensive pits' by Bailey (1990, 1992), have recently been located on the Berm at other locations, such as Callendar Park (NS97NW 46.01) and Garnhall (NS77NE 62.00 at NS 780 779, Keppie 1993). No evidence was found in the base of either example for the emplacement of upright posts or stakes, which might indicate an origin as lilia. Only the upper 1.15m of the Ditch fills was excavated. The Ditch had a surface width of c. 8.2m, although its upper edges were not sharply defined. Coring suggested that the Ditch had a total depth of c.2.5m. The truncated remains of the Upcast Mound, 12.4m-13m wide lay c.2.7m N of the Ditch, and survived up to 0.8m high. 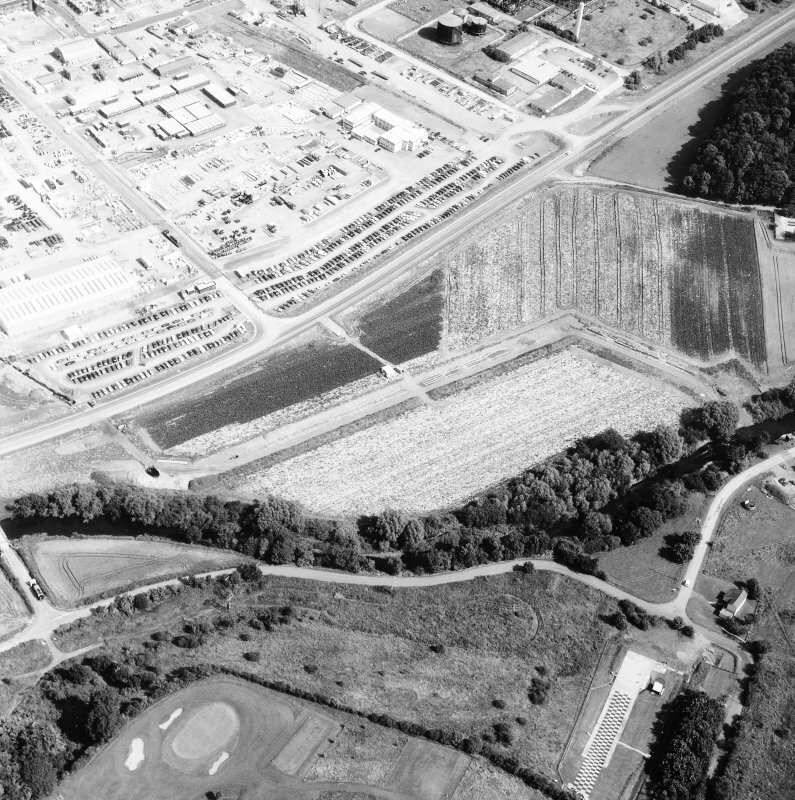 It is unclear whether the gap between the Ditch and the Upcast Mound was a deliberate design feature. Sponsored by: Shell Chemicals UK Ltd.
G B Bailey 1990, 1992; L J F Keppie 1974, 1993. NS 9510 7970 Excavation in advance of pipeline construction has provided further information on the nature of the Roman Military site (NS97NE 21.01) which abutted to the S of the Antonine Wall (NS97NE 21.00). 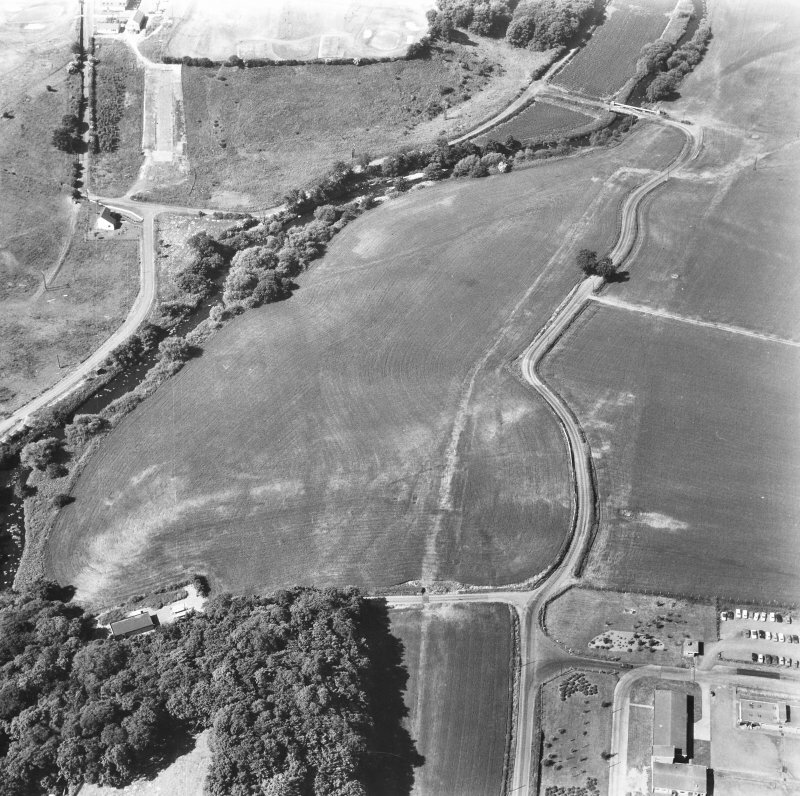 The Military Way ran c.13.2m S of the Antonine Wall and c. 5.4m to the S of the expansion (see NS97NE 21.00). The road was of simple construction, comprising of a c.5.2m wide cambered surface of pebbles set of a cobble foundation. There as no evidence that it was flanked by ditches. NS 9490 7950 - NS 9675 8000 Antonine Wall (NS 97 NE 21.00). NS 951 797 The Antonine Ditch has been detected by the magnetic survey but the anomaly varies in strength and definition; it does not appear with any clarity in the resistance results. The Rampart has been identified tentatively and intermittently in the resistance data, but has remained largely undetected by the magnetic survey. Anomalies which might relate to the Military Way are apparent in the magnetic results but the interpretation is far from confident and alternative origins are equally, if not more likely. Neither geophysical technique has successfully mapped the limits of the Fort or detected any of its main defences. Resistance anomalies within the presumed area of the fort may reflect rubble associated with collapsed buildings but no discrete wall lines have been identified. 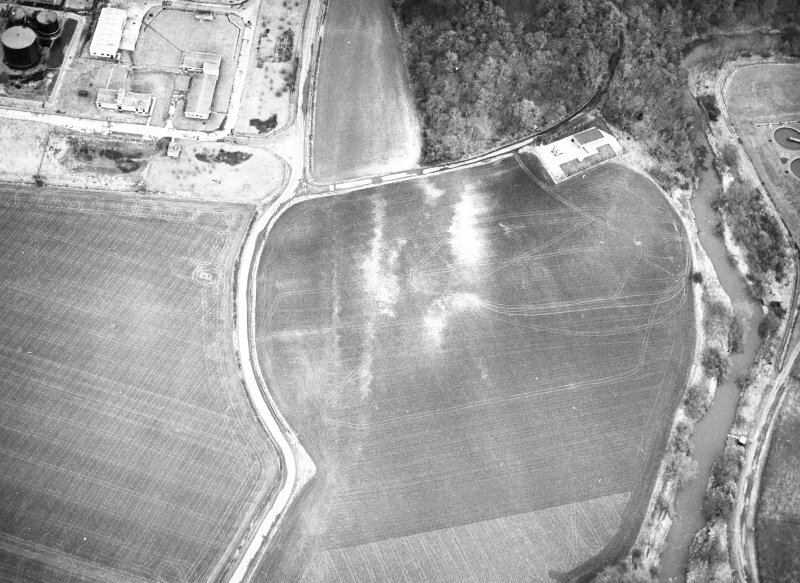 Both surveys have yielded anomalies associated with cropmarks, but the exact nature and function of these features remains unclear. Since excavation has confirmed the presence and survival of archaeological features at Inveravon, their general under-representation in the geophysical datasets is attributed to a combination of natural and modern factors. C Stephens (Information from OASIS ID: gsbprosp1-43987), 14 Mar 2008.